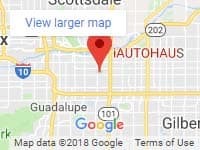 If you are looking for an experienced Jaguar mechanic in the Phoenix/ Scottsdale area, we cordially invite you experience the iAUTOHAUS BOSCH Authorized Service and Repair Center. Our Service center houses the latest factory diagnostic equipment as well as experienced, Certified Master Technicians to care for your prized Jaguar. We proudly offer a 24 month/24,000 Mile Warranty on parts and labor for added peace-of-mind. Our knowledgeable and friendly Service Advisors will assist you with all your service, maintenance and repair needs and take the time to advise you on the best practices to maintain your Jaguar and keep it running puurfectly! Our entire Service Team is dedicated to providing the highest level of care for you and your car. Enjoy a clean and comfortable waiting area as well as free shuttle service and complimentary vehicle hand-wash after servicing. Easily accessible from all parts of the Valley, we proudly serve Tempe, Scottsdale, Phoenix and points beyond! Interested in trading in your Jaguar? Visit our beautiful Sales showroom while you are here to see what new and exciting! Pre-owned Luxury has never been so affordable and you might find the new car of your dreams! We offer competitive financing options (oac) as well as extended warranties. We are located just a few minutes from all East Valley locations Phoenix, Chandler, Mesa, Gilbert and Scottsdale. Just take the 101 to the Broadway Rd Exit and head a few blocks west. Make iAUTOHAUS your one-stop-shop for all your European automotive needs! We look forward to serving you! Welcome to the iAUTOHAUS family.